The emperor shrimp is a small commensal shrimp, about a 3/4-inch in length. It's an interesting creature that forms symbiotic relationships in order to maximize its chance of survival. This species of shrimp can also be kept in a home aquarium but is not a great choice for beginner aquarium-keepers. 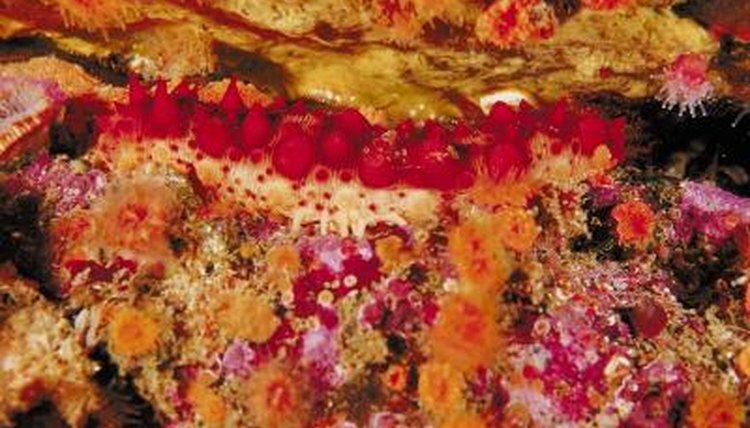 The emperor shrimp develops a symbiotic relationship with a range of nudibranchs and holothurians, or sea cucumbers. The shrimp lives on the surface of the host, which offers him protection from predators and an extra source of food. The relationship benefits the host, as the shrimp consumes any parasites on its skin. The shrimp doesn't stay still, but constantly moves up and down his host, looking for food from the substrate or that has been disturbed by the host. Emperor shrimps are common all over the Indo-Pacific region. They tend to be found anywhere their hosts can be found, such as on slopes and reef flats, or in lagoons and bays. They live on the seabed, because they like to find their food among the sand or substrate on the ocean floor. The emperor shrimp is both a carnivore and a detritivore, so it eats a range of different foods. In the wild, it eats parasites from its host, in addition to algae and detritus from the substrate, and any small meaty foods that come along, such as smaller shrimp or fry. In captivity, they will eat fish flakes, brine shrimp, pellet foods and other small live or frozen prey. You just have to make sure some food reaches the substrate, where they will pick it up. Emperor shrimp can be kept as pets in a home marine or reef aquarium. They will, however, need to be kept with an appropriate host, such as a nudibranch, sea cucumber or Medusa worm. They don't need much space themselves, so the size of the aquarium will be determined by the size and space requirements of the host. Avoid housing them with any of their natural predators, such as larger fish species.